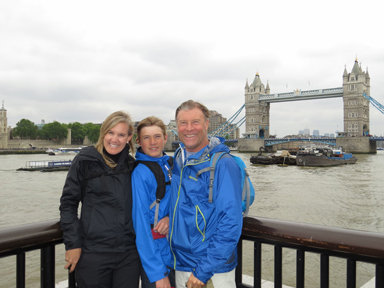 We recently returned from an extended mission trip to Europe. We spent three months ministering in Sweden, Norway, England and France, along with journeys to a few other places. We were blessed to see people make decisions for Christ, get filled with the Holy Spirit, and have healing take place, along with some powerful divine appointments. Europe has emerged as a modern-day mission field, being such a secularized and humanistic place that has left so many of its original foundations. The amount of regenerated Christians averages only 3%, according to a study by the US Center For World Mission that also notes how it has become the least evangelized continent today. Sub-Saharan Africa, parts of Asia and Latin America have surged in numbers of Christians for many of the past decades. For example, looking only at Asia: The Philippines, South Korea and even China have large numbers of Christians now (China’s population is now estimated to be around 10% Christian). Yet France has less than 1% born-again Christians. A friend visiting from France came to a local Foursquare Church to share about missions. She shared about the 9 Foursquare churches they had at that time in France, while a sister from Brazil told about their 15,000+ Foursquare churches throughout Brazil. You can see the dramatic contrast in that illustration. Europe is often presumed to be a Christian place due to its big cathedrals like Westminster Abbey or Notre Dame. However, most who attend services in those places are tourists, while many other non-touristed cathedrals have become empty, and have now been turned into offices, businesses, and even mosques. Secular humanism, atheism, agnosticism, combined with so much dead religion, have left the continent with a generation that has grown up without the Gospel. Those that preach the Gospel often do it elsewhere where it is easier to get results and raise money. We had an evangelist friend from India share how he regularly preached to large crowds in India yet when he came to Europe he would minister to groups of only 8 or 10 people. He began to realize that Europe was more unreached in many ways than India, which has large amounts of Christians in some areas. Missions have become associated though with poverty relief and development, forgetting that man’s greatest need is spiritual and is met in Jesus Christ. While Europe has places that are impoverished like everywhere else, it isn’t as stark as some places, and thus adds to why it has been overlooked. Thus, in reality, it is actually on the cutting edge as an emergent mission field in our time for those with eyes to see. Missioligist Peter Wagner updated his mission group’s focus from the 10/40 window to the 40/70 window to include Europe as a target for places needing the Gospel. Billy Graham’s Evangelistic Association communicated at a conference how Europe is a place now that needs the Gospel focused there. Pat Robertson’s organization published an article on the need to re-evangelize Europe as well. The Gospel needs to be preached and the Holy Spirit needs to be poured out to save the lost, as well as heal, strengthen, minister, and encourage those that are believers. All these things we sought to do as we ministered there. Ministering there does bring a lot of spiritual warfare and opposition. A pastor friend from Norway who just returned from ministering in India said he experiences way more spiritual warfare in Norway than India. That should open our eyes and make us think for a moment: Seeing people getting saved, filled with the Spirit, touched, healed, and ministered to by God’s power in Europe is all the more awesome, as it shows the light overcoming the darkness. France's Loire Valley. Rich in history and vineyards. We were blessed with a spiritual harvest! Preaching in Hässleholm, Sweden where we were blessed with great fellowship and the Lord's power. 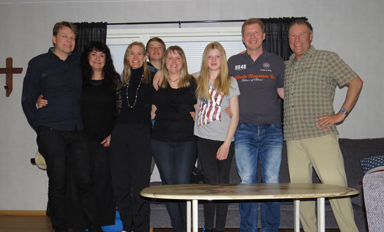 We began our ministry in Sweden, in the region of Småland in the town of Gamleby. The Lord started things off with a very powerful divine appointment, which was followed by another the next day, along with doing a number of different meetings. Right as we were preparing to do our first meeting in Sweden, our friends introduced us to a young sailor who just recently came to Christ. As we were able to spend some time with him, it led to sharing some Scriptures and prophetic words for him, when the Holy Spirit began to fall upon him in a powerful way. We began to pray for him and the Lord filled him with the Holy Spirit for the first time in his life in a very, very, significant way as he lifted his hands and tears streamed down his face. He said to us afterwards that he’d never experienced something so real and powerful before! We encouraged him also to pray for others with us right then as we continued to minister. He began to get words for them right there, and they were really touched through what he shared. It was a powerful time in the Holy Spirit, with a spontaneous, naturally-supernatural time of filling and discipling. The Lord continued the same theme in the meeting we did that night that was held in a little “boat-and-tackle barn” overlooking the bay. Not a bad place, Jesus was born in a barn, as was the Pentecostal revival. The Holy Spirit was powerfully equipping people, and in the same meeting later, teaching them to pray for others. One young woman was very shy and just sitting in her seat but I had her get up and pray for a lady who was beginning to speak in tongues. The Lord poured out as she stepped out and gave her some words. Then the one who’d been praying in tongues began to pray for the young lady in return and they both got powerfully touched and encouraged. We could see “the priesthood of all believers” which had been our message, being activated! We had another divine appointment when our friends’ son returned home from college the next day, and as we ate lunch together, he had a powerful encounter with the Holy Spirit while we shared some Holy Ghost stories with him. The power of God fell as we were sharing and the glory of God began to come over him and fill him, visible signs were evident of God filling his heart as tears filled his eyes. We then prayed for him as the Lord powerfully ministered to him and his mom. That night he helped us minister in a youth meeting that by God’s hand spontaneously came together, and he helped us by sharing what he experienced and praying for others, giving away what he received earlier that day. We had two young ladies receive the Lord at the youth meeting. One of the young ladies’ mother came to another church meeting we were doing the next night to tell us how overjoyed she was as she had been praying for her daughter to get saved for a long time! The mother, as well as her daughter, were powerfully empowered by the Holy Spirit as we prayed for them both that night, as were many youth in both meetings. Those who came had not really been around the move of the Holy Spirit much before, in fact they were very shy in the beginning. However, God’s presence came over them and began to fill them, and they began to receive and were learning to pray for one another, with hugs and tears, and once it got flowing, continued late, late, into the evening. Once they were introduced and experienced the power of the Lord, they didn’t want to stop. In fact we got to bed after 2:00 a.m. The last meeting we did in this area also went late into the evening and the young people from the night before showed up with an extra friend and joined in getting empowered more and then kept on praying for each other into the night, after the meeting was long over. Many others were powerfully filled and renewed as the Holy Spirit poured out Pentecostal power on “Pentecost Weekend” at this traditional mission church, as well as stepping out to pray for one another. This is significant for Sweden and this area. We had another divine appointment when leaving the area of Gamleby with a man who gave us a ride to the train station. We found out that he had gotten saved and radically filled with the Holy Spirit when Lonnie Frisbee came to minister in Sweden during the Jesus People Revival many years back; he is actively serving the Lord and walking in the Spirit today. We shared similar experiences, both of us having been baptized in the Holy Ghost for hours when we first got filled through Lonnie’s ministry back in the day. 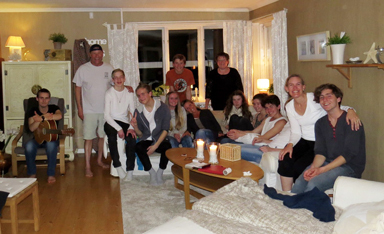 Youth meeting in our friends' Swedish home. Two young ladies got saved, one of whose mother was overjoyed! Hässleholm, Sweden. We experienced some powerful moves of the Holy Spirit at some home meetings. We found an incredible deal coming into Europe via Iceland. We found out pretty fast a few things about Iceland: The name fits it as it is really, really, cold. It has some of the coldest weather we have ever experienced anywhere! Our hands would burn like they were getting frostbite anytime we’d take them out of our pockets when outside. I’ve never been in weather that makes you that cold, that fast. When the cold north winds blow you are transformed into an instant icicle. And it is not cheap! Being a remote island where a lot of stuff must be shipped in makes it expensive. I had just prayed that odd little prayer without thinking much about it a moment ago and we walk right into a situation of unique provision. The Bible says, “God works in us to will and to purpose.” (Phil. 2:13) The Holy Spirit can lead us to pray a certain way so that we realize that what happened, once fulfilled, wasn’t just some random thing but a gift from above, divinely led into. Well, we ended having lobster soup with huge chunks of lobster, as well as other dishes with salmon, lamb, mussels, cod, and some good old hamburgers; there were hot dogs available too but I’d had more than enough of those. We ate until we couldn’t eat anymore and went back to our little hostel and lied down on our little cot-like thing and fell into a food coma and slept the night away. A nice feeling when you’ve been cold and hungry. It was a great blessing at just the right time, as I’d had all the boiled hot dogs I cared to have, and Mercedes had been thinking how nice it would be to try some different foods there in Iceland. We also got stuck in a blizzard while driving on a mountain but God heard our cries and cleared the storm for us. Ministering with an immigrant church in Norway where God moved in power. Preaching in Mandal, Norway on the southern coast. We were blessed with some awesome times there. After ministering in Småland we headed to Skåne, to the city of Hässleholm, and then after that to Varberg on the West Coast. We did a meeting first for the leaders of New Life Church in Hässleholm where we did some teaching and then prayed over them. The Lord came in power, some who were overcome by the Spirit ended up on the floor. One of the men touched said he had not experienced a move of God like that in many, many years. He was greatly rejoicing to see the Lord pour out His Spirit like this after such a long time. We saw the Lord continue to move as we ministered in some of the home groups during the week where we taught and activated them towards the “priesthood of all believers” and practicing the gifts of the Spirit and praying for one another. It was a blessed time in Hässleholm as we had a great time of fellowship with Pastor Daniel and his family, and with the people at the church, while enjoying many great meals including a traditional Swedish meal of roasted pork with lingonberries, caramelized onions and pickled cucumbers. We got to share a lot of Holy Ghost stories as well as teach in some intimate setting, and experienced the Lord empowering His people. We also did an outreach with a group called “Biker Church” at an event held by “The American Car Club of Sweden.” This type of event is really popular here: classic American muscle cars were everywhere, along with people dressing in Rockabilly style. We did some music and helped share and gave out Bibles. We also had a divine appointment with a guy that spoke good English and after sharing with him for some time we ended up praying with him as he opened his heart to receive Jesus. We were stoked, people getting saved in Sweden isn’t all that common. We had a powerful meeting at New Life Church on Sweden’s Mother’s Day. God did so much—some highlights follow: We shared about Lonnie Frisbee and the outpouring that happened on Mother’s Day years back at what would become the Vineyard Movement. The Holy Spirit showed up in power and poured out His presence, with many being filled and empowered, and others being brought to the floor as God filled them. One teenager was especially filled powerfully as tears streamed down his face, as were others. I had a word for a shoulder condition: a woman named Daisy was overcome by the Spirit and on the floor and healed of a frozen shoulder by the time she got up. The worship leader had a powerful encounter with God also, and was touched deeply by the Lord’s presence as waves of the Lord’s presence came over her. As we came to a seeming close the Spirit of God suddenly broke out again, the Holy Spirit just kept things going as He filled a twelve year old boy for the first time in his life and came upon his father who just kept shaking under God’s power. One of the workers of the church was knocked to the ground and couldn’t stop laughing as God released His joy over him, the fruit of the Spirit made manifest! It was an awesome renewing time in God’s presence and power, and we were told by some that it was just what they needed living in such a secularized humanistic country in Europe. It is always awesome when the Lord moves, but even more so in such spiritually challenging places. We then ministered in the city of Varberg on the West Coast in a Pentecostal church. We felt led to give a message on evangelism and reaching out to the lost. The pastor shared afterwards that he had just began such an outreach program so the timing was clearly from the Holy Spirit. The Lord empowered many with the Holy Spirit and was releasing a burden for the lost. A woman began praying in Spanish quite strongly; it happened that Mercedes talked to her afterwards and we found out she didn’t speak Spanish…she was actually speaking in tongues in Spanish, which of course was quite a sign and wonder, glory to God!! Prekestolen, Norway. The name means "Pulpit Rock," quite fitting as it is awe-inspiring creation! After Norway, we travelled to London, England where God used a divine appointment with a Jamaican evangelist to help direct our course while we were there in England. 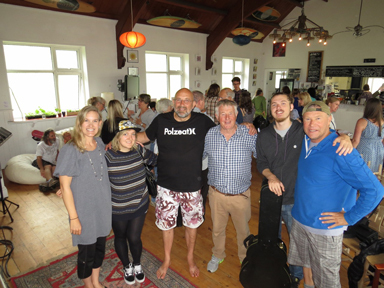 We next crossed the North Sea by ferry into Norway and were blessed to connect with old friends upon our arrival. After a little time catching up, we went out to minister in the city of Mandal. At different meetings we witnessed the Lord move in power. Eight people received Christ as we ministered there and many were filled with the Holy Spirit as well as some receiving healing. We ministered first in a youth meeting where Mercedes and I both shared our testimonies. We told of how God broke into our lives when we were both in our youth, as well as some Holy Ghost stories. The Lord touched the heart of four young people that we prayed with that night who surrendered their hearts to Jesus! Praise God! Others were filled with the Spirit and ministered to as well, and it was a blessed time. 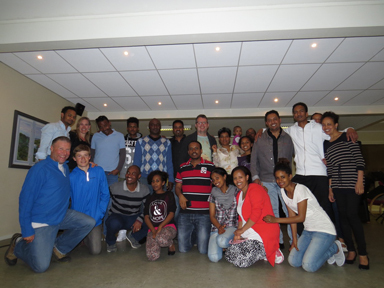 We preached next at an immigrant service with people from Ethiopia and Eritrea in Africa. We preached the Gospel and had 4 people there make a decision for Christ. The Holy Spirit powerfully filled many, accompanied by powerful manifestations, along with healing and deliverance. One woman testified to receiving a powerful healing in her arm, she couldn’t lift things before but after the Lord touched her she could lift things without pain now! 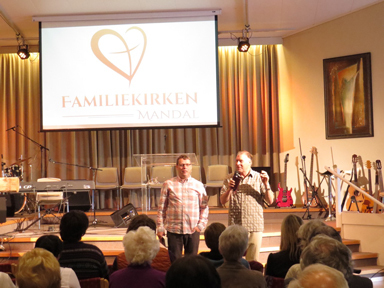 We then preached two Sunday services at Familiekirken (Family Church) in Mandal. The Holy Spirit filled the atmosphere as Mercedes and I both shared experiences of our time in the revival in Argentina and how it impacted us. The presence of the Lord overwhelmed the meeting even during the preaching—I was so overcome I could barely continue to speak. God filled the place and touched many. We received testimonies of healings, breakthroughs, and those who were greatly encouraged. The Lord met many with intimacy and grace. We received many testimonies from young and old of how blessed they were. Some told us afterwards about receiving gifts of the Spirit like tongues and prophecy. We also got to try some windsurfing with the pastor’s sons who rigged us up and gave us a few lessons. Like surfing, it is harder than it looks, but fun all the same. 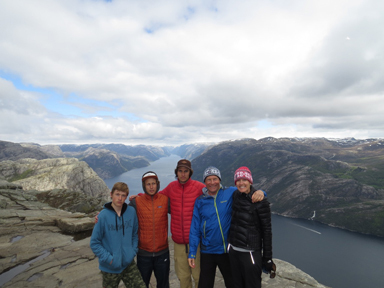 They also took us to visit Prekestolen, the famed Pulpit Rock near Stavanger. Soaring 2000 feet above sea level, it has a straight down, even inverted view, to the famed Lysefjord below. It is a little dizzying up there as it takes a hefty hike 4 miles up (you gotta hike back down too making it a full 8 miles r/t.) There’s a lot of steep elevation gain and plenty of rocks to climb over getting up there, but it is all well worth it when you see the stunning scenery and classic Norwegian fjord views on the top. We took a route through the mountains on our drive back and were surprised to see how much snow was still in the mountains in summer. We also saw some awesome waterfalls and even a couple moose, Norway definitely has some beautiful scenery! Tubestation, Cornwall, England. Its outreach to the surfing community fit our background well! Preaching in Tours, France, where the Lord met us with grace and wave after wave of His love and power! We had ministry already scheduled for France later, but felt led to go to England and the UK in the interim, even though we didn’t have anything set up ministry-wise beforehand. After arriving in London and taking in a few sights we had a divine appointment. While checking out of the place we were staying in and not sure what we were going to do next, I saw a woman in the lobby and just had this feeling she was a believer, so I went over and talked to her. It turned out she was a fellow minister heading off on a mission trip herself. We ended up praying together and she felt led to give us a word that “ God would open a door” as we went forward. With that encouragement we headed out, praying as we went. We felt we should have a time of rest in Wales after all the time ministering in Scandinavia. It was a refreshing we needed and it gave us time to pray. We had some powerful times of visitation and refreshing and saw a few sights including the smallest church in all the British Isles built by a Celtic minister in the 6th century. As we took in the sight on the sea, an amazing double rainbow appeared right in front of us. It was a sign that God was with us and so we pressed on knowing He would go before us. We had a friend from Cornwall we’d connected with in the U.S. and another friend in Southport but weren’t clear which way we should head first or when. After prayer we felt led to wait a bit and then head to Cornwall and it turned out to be God’s timing! We ended up arriving in Cornwall right when our friend’s parents just came back from vacation (if we had come any earlier no one would have been there). Turned out that they had a nice trailer on the beach we could use for a few days. It had just been vacated by a guest the previous day (if we had come any earlier it would not have been available). So it all turned out to be God’s hand with us and His timing, even more so as we met the pastor of a church there. There is a church there that has an outreach into the local surfing and beach community. We met the pastor for the first time and just connected immediately with him. Even though we just met, he asked us to share and do the music and share some testimonies at their upcoming Sunday service. It is miraculous enough to have that happen anywhere when you’re just showing up and meeting someone for the first time, even more so in the UK as the English like to plan things well in advance. So God went before us, and did it again, right there in the UK, just like last time on our previous trip! I think he likes to show us “nothing is impossible with God!” We were stoked to get to share some music as well, it is a developing side of our ministry that is just emerging more all the time. We felt the Lord confirming the importance of stepping out in that area as we performed! We were blessed to have some of the fellow believers provide some nice surfboards for us to use while there and the Lord brought in some good waves. Surfing is one of their main outreach tools and we were stoked to be constantly meeting and sharing with people there. We were thankful since we didn’t have boards with us on this trip because of the high price airlines are now charging to bring them. God used the friends there to provide beyond what we expected. We also got to visit a few places important and integral to the English Reformation: The White Horse Inn at Cambridge used to be a place where reformed-minded students and professors would meet to discuss the teaching of Martin Luther and the Reformation. A plaque marks the spot and mentions how Luther’s teaching so permeated the place it became a “little Wittenberg.” From the influence of Luther, ministers like Tyndale, who was the first to translate the New Testament into English from the original Greek, were raised up. Scholar David Daniell says a full 90% of the King James Bible is actually Tyndale’s work, the scholars King James hired revised what he had already laid the groundwork on. We visited a monument to Tyndale on the Cotswold Way that memorializes this martyr for the cause of Christ. It brings to life instruction our son Patrick receives as we teach him and he sees these places up close and personal. 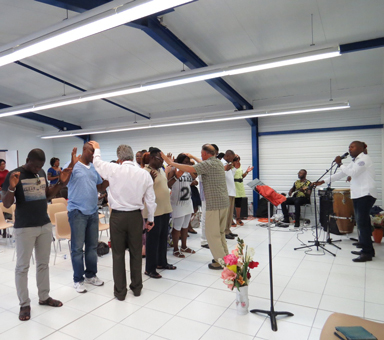 Spiritual harvest in Chateaudun, France. The Lord met us with pwer every step of the way. 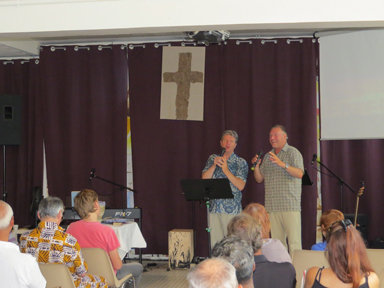 Sharing a few songs in France as an outreach to unbelievers. 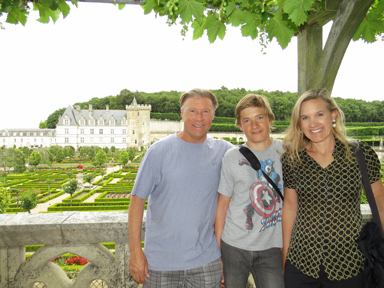 We had a great time ministering in France, the Lord met us each step of the way in everything we did. 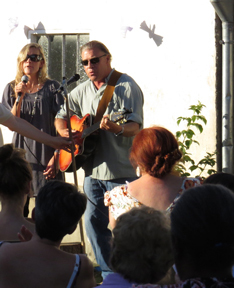 We did five meetings in a row in the Loire Valley: at Vendome, Chateadun, Tours, and St. Cyr-sur-Loire, including an open-air evangelistic outreach where we performed some music as well. This particular outreach was geared to non-believers. We had people making decisions for Christ, being filled with the Holy Spirit, and some healings going on. Before we even began ministering, we met and stayed with some old friends who we prayed with as they are battling some health issues. We had an awesome time of visitation as the Holy Spirit met us in power. We also had a couple of salesmen show up while at their house and we invited them in, witnessed to them, and then we prayed over them. So, before we even started doing any official evangelistic outreach, we were already reaching out with the Gospel in a spontaneous setting! After that, as we began to minister in the meetings that were set up, the Holy Spirit met us from the start. 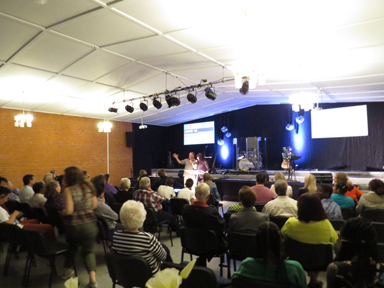 We had an outpouring in the first meeting that just filled the place with God’s power. There were many who made decisions and re-dedications to Christ, and as He poured out His presence the Lord was also baptizing people in power, releasing spiritual gifts and healing. A wild Holy Ghost moment took place as God’s power struck our friend Pastor Nixon when he came up just to give me a hug. As he came over to me the power of God struck him and he fell laughing to the ground instead. He fell on top of me and we both got blessed and refreshed with a little floor time ourselves! Then Pastor Jean-Francois was struck to the ground and bowled over by the power of God when I had just barely laid hands on him, where he remained for quite some time as we ministered to him. The power of God was so manifest it was just blowing our minds that this was happening in France! Each consecutive meeting was marked by a powerful move of the Holy Spirit with many people in each meeting getting filled with God’s power. Healing and deliverance was taking place as well as having people making decisions and re-dedications to the Lord. A lady who had showed up when we went to pray for our friend battling the health issues earlier also decided to show up at the Sunday morning meeting; the presence of God struck her so heavily when we prayed for her that she laid there on the ground for over an hour. Another young boy was face first into his seat as the presence of God met him and he spent the rest of the time praying and receiving. It was truly an awesome time seeing the Lord break through the warfare and resistance often seen in France and we were overjoyed to see God touching and ministering to so many! We were blessed to get a little time at the coast and a bit of French surf before returning home. God uses everything for good and we met a guy from Wales who was rigging us up some boards we hired. We got to share a bit with him and plant the seeds of the Gospel. We were stoked to get refreshed in some good waves at Lacanau, after so much ministry.. It was in fact one of the best times at that particular location. It felt like a real gift from on high after all we’d been doing as well as a relief from the heavy heat wave that had hit France while we ministered. We’ll try and share a little more in depth on some of these stories and divine appointments in some of our online blogs. If you don’t receive that you can email us at gracewm@flash.net to be included. Thank you so much for your prayers and support, we had some costs coming back that we are still dealing with. All your help and prayers and support are truly a blessing and much appreciated. We came back just a few days before heading straight up into the mountains to preach and minister at a summer youth camp with El Calvario Church for three days. We were blown away at how much God moved and poured out His Spirit on everyone there, it was just a glorious time of encountering God and seeing young people equipped and called into their purposes. We also were blessed to minister in downtown San Diego at Disciples of Christ Church for four of their Sunday services where we had many make decisions and rededications for Christ, as well as many being filled with the Holy Spirit and some healings as well. We also spoke at a missions camp on a Native American Reservation with Pastor Yaseer, about the need for the Gospel to go to every tribe, tongue, language, and people. The Holy Spirit who empowers us to do Christ’s mission, filled, encouraged, and empowered many there! May God's blessings be richly poured out upon your life! XEC 1310 AM --9 pm Sat. night ---San Diego and Tijuana, as well as online.